Who cares if we don’t have -20 degree wind chill factors or 17 inches of snow on the ground? When the temperature plummets into the mid-50s with rain pelting down, San Diegans howl about our winter weather along with the rest of the country. 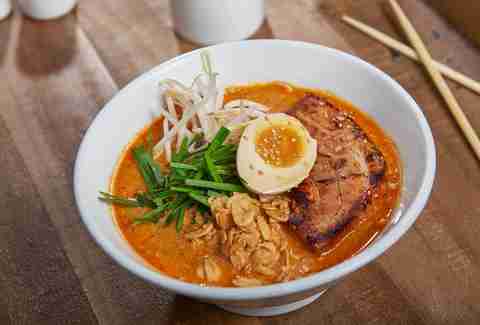 Rather than hibernating under a blanket with your remote targeted on your Netflix queue, head out to one of the ramen places that have popped up all over the city for the perfect antidote to winter’s wrath. Of all the bowls we’ve slurped and sipped, these seven shops make the cut for our favorite chill chasers. Hokkaido Ramen Santouka is located inside the Mitsuwa Market, but don’t let the food court atmosphere stop you. The original restaurant was founded by Hitoshi Hatanaka in Asahikawa, Japan, a city famous for recording the coldest temperature in Japanese history (-41 degrees Celsius, in 1902), so one can assume it knows its way around a bowl of piping hot broth. 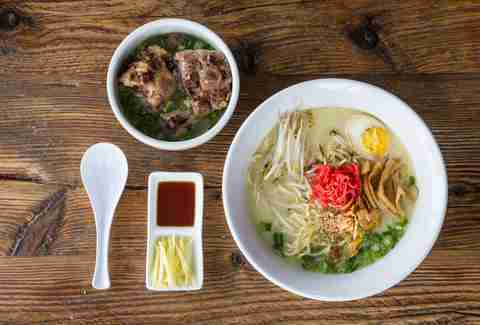 If you’re new to ramen, the glass enclosed visual menu shows you exactly what will be in your bowl. A good start is the Tokusen Toroniku Ramen: plain broth and noodles served in a signature blue bowl, garnishes and succulent slices of pork cheeks on the side, ready to be dipped and devoured. Cash only, an ATM is located inside the market, so head there before you get in line. 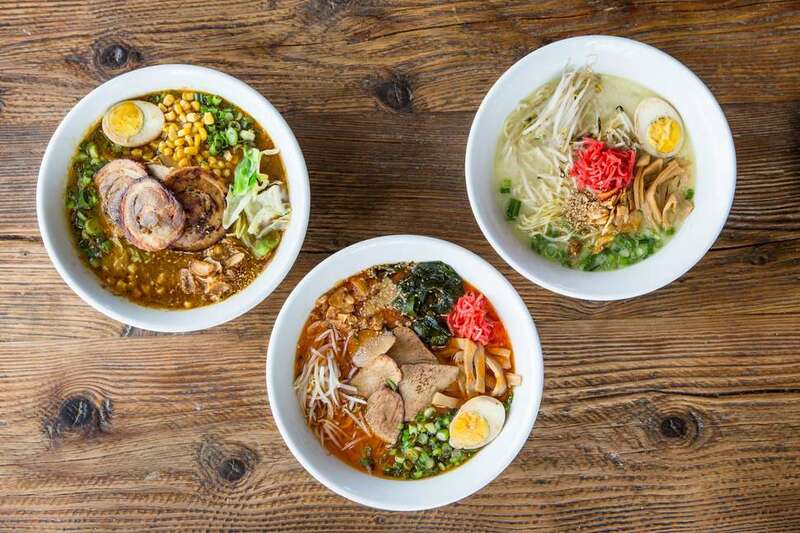 Noodles made in-house daily are what make the difference at Nishiki Ramen, the wildly popular Japanese chain’s first foray into the US market. You can’t go wrong with Smoke Bomb Black Ramen: smoky roasted black garlic sauce, melting tender pork belly chashu, and a perfect, velvety “slow egg.” Vegetarians and vegans will appreciate the hearty, warmth-inducing mushroom broth option, and vegan noodles are available for a slight upcharge. The adorable kid’s meal features tricolor pasta, minced pork chashu dipping soup, chicken tender, fries, and a yogurt drink. The secret to Rakiraki Ramen and Tsukemen’s award-winning ramen, according to Executive Chef and Owner Junya Watanabe, is putting passion into every detail of the dish, from the alkalized water, which is used to make both its tender/chewy noodles and exceptionally delicious broths, to the flame-blistered aburi-style toppings. Cozy up to the Rikimaru Oxtail Ramen with double thick noodles in rich chicken broth with a bowl of fall-off-the-bone oxtail and ponzu dipping sauce served on the side, or the Ultimate Supercharged Collagen Tonkotsu Ramen with double thick noodles, spicy miso tonkotsu broth, prime X.O. kurobuta pigs feet, a five-spice pickled soft egg, and spicy red miso dipping sauce. Ramen Yamadaya’s specialty is milky-colored, long-simmered tonkotsu that ranges from light and delicate to oily and viscous, typically served with thin, straight noodles. Cold rainy nights beg for a bowl of black garlic oil-infused Tonkotsu Kotteri Ramen, a thick, rich umami blast served scalding hot to ensure that the abundant pork fat remains liquefied. Succumbed to whatever bug is going around? 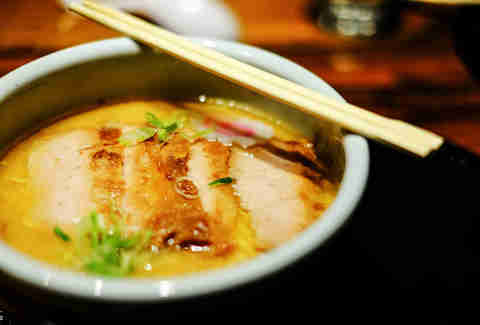 Sip Tonkotsu Spicy Ramen for your choice of sort-of-tingly to sinus-clearing heat. Both locations offer delivery through a third party (with an upcharge). Chef/Owner Sam Morikizono continues to expand his Tajima empire throughout San Diego and into Tijuana, proving that Japanese comfort food has universal appeal. Build your bowl from a base of tonkotsu, miso, chicken, or curry broth and thin, fat, gluten-free, or vegan spinach noodles. 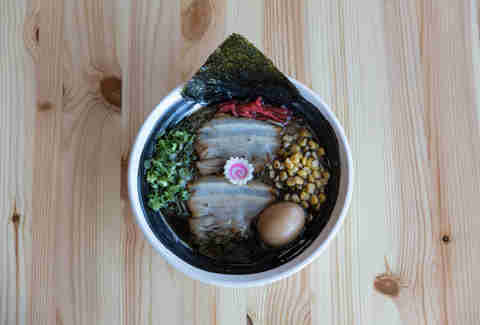 The standard toppings of pork or chicken chashu, half a ramen egg, green onion, sesame seeds, and Japanese seaweed are already included -- make it your own by adding on toppings like tender kakuni, mabo tofu, or sour/spicy red bomb paste. Rice bowls and a la carte small plates are reasonably priced, and the Mercury Street and Convoy Street locations serve tasty tonkatsu, teriyaki, and tempura entrees if soup isn't calling your name today. Chewy, springy noodles are the star of master ramen chef and owner Takashi Endo’s luscious tonkotsu, miso, and tantanmen bowls. While a central factory in Japan provides over 100,000 servings of noodles each month to his Japanese locations, here at his first US shop in Kearny Mesa, the noodles are handmade in-house daily. Using only flour imported from Hokkaido, Japan, alkaline water, salt, and no artificial color or preservatives, head noodle maker Ryosuske Goto produces 55 pounds of noodles daily. Their distinctly wheaty aroma and flavor are perfectly paired with your choice of broths and toppings from the blessedly short menu. Pro tip: There’s a limited number of noodle servings per day, so don’t wait until the last minute to go. 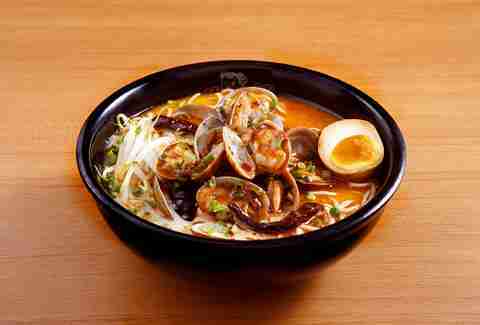 Ajisen Ramen brings the fast-casual concept to its 700+ international locations. The huge menu includes gyoza, baby octopus, fried oysters, chicken kaarage, and more, as well as udon and rice bowls, sushi, salads, and desserts like mochi and snow shaved ice. The thin Kumamoto-style ramen is made daily in-house -- it is meant be eaten right after it’s served to best enjoy the traditional chewiness of the noodles. Ward off a cold with spicy sesame Tantanmen ramen, a new, stylistic interpretation of Sichuan Dan Dan noodles, or satisfy your crunchy tooth with Beef Mille Feuille Katsu, a Napoleon-like stack of panko-crusted shaved, compressed beef fried golden brown and served beside a simple tonkotsu broth. Simple and straightforward, the broths at Yakyudori coat the well-cooked noodles with a mild, savory/sweet richness that lingers on your tongue. Several versions are available, including shio, shoyu, Nagoya, regular or spicy miso, and tonkotsu, and a light, fresh veggie style. Stop in at lunchtime (11:30am-2:30pm daily) for the $10 combo specials: a small ramen of any style, a side dish or appetizer, and a small salad. After 5:30pm, the yakitori chefs turn out skewers of grilled chicken, pork, beef, seafood, veggies, and quail eggs to accompany your ramen. Bonus: In the frustratingly parking-challenged Convoy Street area, Yakyudori’s expansive lot almost always has enough spots to accommodate its clientele. Mary Beth Abate is a San Diego-based freelance writer by way of Chicago, Cleveland, and Baltimore. Her hobbies include yoga, pickling and fermenting various vegetables and beverages, reading cookbooks and traveling through Mexico. Keep up with her experiments @MaryBeth_Abate.